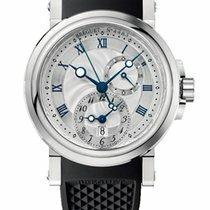 Breguet Marine Automatic GMT 5857ST/12/SZ0. Stainless steel 42mm case with stainless steel crown. Stainless steel fixed bezel. Silver colored dial with Roman numeral hour markers. Hours, minutes, seconds, date and GMT (second time zone). Date window located at the 6 o'clock position. Automatic movement, Caliber 517f. Stainless steel bracelet with deploy clasp. Power reserve up to 65 hours. Water resistant up to 100m or 330ft.